During the Menzies era, with the blessing of the Prime Minister, the British government exploded twelve atomic bombs on Australian soil. RAAF pilots were ordered to fly into nuclear mushroom clouds, soldiers told to walk into radioactive ground zero, sailors retrieved highly contaminated debris – none of them aware of the dangers they faced.But the betrayal didn’t end with these servicemen. Secret monitoring stations were set up around the country to measure radiation levels and a clandestine decades-long project stole bones from dead babies to see how much fallout had contaminated their bodies – their grieving parents were never told. With exclusive access to hundreds of nuclear veterans, Frank Walker has written a startling exposé of the callous betrayal of men who served their country. Maralinga is an impassioned plea for justice for the nuclear veterans who have been betrayed by politicians from Menzies right till today. Veterans who followed orders and walked into British nuclear bomb clouds have found they don’t have the same rights as other veterans because they didn’t serve in wartime and didn’t serve overseas. Frank Walker is a veteran journalist. His newspaper roles have included being chief reporter for The Sun-Herald covering defence, veterans affairs, national security and terrorism. He’s also worked on The Sydney Morning Herald, The National Times, for News Limited in New York, and for Deutsche Welle international radio in Germany. He has published two books to date, The Tiger Man of Vietnam and Ghost Platoon. He lives in Sydney. 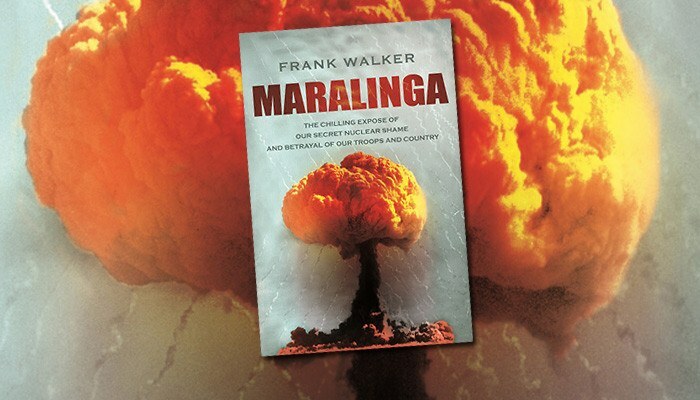 Join veteran journalist and author Frank Walker to hear the shocking truth about Maralinga: the abuse of our servicemen, scientists treating the Australian population as lab rats and politicians sacrificing their own people in the pursuit of power.